How long have you been a paranormal investigator? I have been interested in the subject of the paranormal for more years than I care to remember but I have been researching and exploring it for about the last fifteen years with an increased level of interest and desire to know and understand more about the subject. The Team at Wexford Paranormal as it currently stands has been working together for almost five years now. What area of the UK/Ireland are you based and/or focus your paranormal investigation attention on? We are based right in the very south east of Ireland (your own stomping ground) but our interest in the subject of the Paranormal has brought us too many locations around the country. We spend a lot of our time in the wonderful Enniscorthy Castle, which has stood as guardian to over 800 years of Wexford’s history since it was first built in 1190 and we also spend a good deal of time at Duncannon Fort which has watched over the Waterford estuary since 1588. While this affords the opportunity in a more abstract way to explore and test current methodologies as well as testing one or two ideas of our own, it is in fact the private cases that we are contacted about that hold significant interest for us. At a very fundamental level it is the opportunity to hopefully effect positive change for people who experience things that possibly elude their understanding or conventional reason that interest us most. “Expert” is a scary word and that might sound funny coming from someone who is prepared to spend long hours in dark and eerie locations but in the context of this particular field it is perhaps a word that is difficult to use. Learning, experience and a considered and ongoing review of your practice, techniques and perspectives based on both your experiences themselves and experiential analysis all contribute to your effectiveness as someone who explores or investigates the Paranormal. If considered objectivity and reasoned analysis are areas of expertise then these are some of the skillset I think I bring to my exploration of the subject. Tell us about your research for Haunted Wexford: did you find such a huge undertaking daunting? Because I had never written anything on this scale before it was a bit of a journey into the unknown (no pun intended!) It is one I enjoyed however and while there was a certain brief to follow I hope that what has been produced is a piece of work that offers something to both the curious onlooker and the more seasoned investigator alike. Throughout the book we get to visit some of the more well-known locations around the county such as that of Enniscorthy Castle, Duncannon Fort and Loftus Hall. In these chapters we take a look at the history of the location, the legends and stories associated with them and then what, if anything we may have found when we spent a night (or nights) at each respective location. These chapters also include accounts in some instances of what other visiting Teams have reported from the locations based on their experiences. On a personal level, what I like about the book are the chapters that relate to some of the private cases. Some of which we had permission to identify that actual location and those involved while some for reasons of privacy remain anonymous. Hopefully those who choose to read the book will enjoy the way each story is presented and perhaps even feel while reading it that they are present with us at each location as we take each tentative step further into the unfolding story. How has the reaction been to your book so far? Thankfully so far the reaction has been very good. I have had messages from people in the USA and Australia who have read it and enjoyed the content. I think local interest books such as this seem to appeal to people. There was a fantastic turnout for the launch and I must also add that it was a great pleasure to have Steve Parsons write the forward for it. What was your first Paranormal encounter? I actually mention this in the book itself but one of the most vivid memories I have from when I was about twelve years old was being out in the back of our house getting coal when my name was called. I went back into the house but no one had called me from in there. I returned again to continue the job when my name was called a second time. This time I exited through the side gate of the house thinking one of my friends was messing about but when I looked over the wall of the next house there was no one to be seen. I returned to the job in hand when one final time my name was called. This time I turned to look towards the gate which I had left open, only to see the form of an old woman standing in the open gateway. The ting was though that in so far as I could clearly see her shape and form I could also see through her as though she was semi-transparent with details and street furniture visible through her form. That experience more than perhaps any other is what has led me to pursue a greater understanding of the subject of the Paranormal. Do you believe in ghosts, and if so, what is a ghost? Tricky question really. I believe based on experience that there are things we don’t understand, events and occurrences that appear to defy reason and logic and sometimes the cause of these things are attributed to Ghosts or Spirits but truthfully once we make the leap from “not understanding” an occurrence to “it’s a ghost” then we have moved from a statement relating to an observation i.e. “It’s a significantly unexplained event” to one that involves an aspect of projecting a personal narrative i.e. “it can’t be explained therefore it’s a ghost”, and in this instance we refer to all the currently held perspectives as to what a Ghost actually is. For me, belief, by itself, is not a sound basis for the existence of anything but by the same token it is a very necessary component in the principle of hypothesis, test, and hypothesis again. What evidence have you personally uncovered that makes you consider ghosts are real? Considering my answer to the last question it is difficult to not have this sound almost like a contradiction but bear with me. As I mentioned earlier we have an ongoing association with Enniscorthy Castle and as such have carried out many visits to the location. Over that time and indeed with independent observation we have conducted experiments. For example, not wanting to rule any form of exploration out we were using a Frank’s Box. Subsequent analysis of the audio recordings revealed that someone called “Jim” appeared to be communicating through the device. Subsequent follow up enquiry caused us to get responses to questions regarding his surname, wife’s name, Son’s name etc. We then presented this information to the Manager of the Castle only to have her come back to inform us that she had located him in the 1901 census. It is vital to record such sessions, not only for gathering evidence but also to be able to review and rule out audible pareidolia. I would also add that when answers are given there can be a set of assumptions as to where this comes from (be it that of a Ghost or whatever) but it is important to consider that in some way unknown to ourselves WE are actually the Ghost in the machine. That in some way unknown to ourselves on a conscious level we are transmitting the information and actually talking to ourselves. Continued study of this theory is important and in all explorative study nothing is off the table until it is! Are you sceptical of the claims others make of their findings? I actually think we all should be open-mindedly sceptical even about our own findings! Even when we present an analysis and conclusion of our own research it is important to park it knowing that it is something that can always be picked up again and re-evaluated with fresh eyes, further learning or additional understanding. What I will say though is that sometimes people will send you things, be they photos etc. that they don’t understand and seek your opinion but can become somewhat put out when you don’t tell them what they want to hear! In spite of a coherent explanation they still want to believe that the bug in their photo is a ghost, that the lens flare is a Spirit even though the simple reason might be that light reflects at the same angle it strikes something and therefore the desk lamp, or window, or torch to the left of the photo or just out of shot is causing the anomalous light object on the right. It is important to consider that where two or more possible explanations exist, the simplest one is usually closest to the right one until any further evidence to the contrary can be offered. This is not to debunk everything as explainable but to attempt to add greater value to the pieces of evidence or findings that you can’t offer a reason for subsequent to a rigorous analytical process. At the end of the day I don’t see it as a part of what I do to have to “prove” anything. Proof in this situation can become a big burden but if we collect evidence then over time the cumulative aspect of that evidence might lead to the discovery of a truth. How do you prepare for a ghost hunt? What tips would you give for someone going on a paranormal investigation for the first time? Don’t believe everything you see on TV. More often than not it is long hours of nothing happening but from my point of view on the subject, even when nothing takes place you have learned something. What is your favourite piece of paranormal investigation equipment? That’s a hard question! I don’t think I can even answer that. I quite like it when a number of pieces of equipment work in tandem during an investigation. I remember one time while investigating with some good friends from Paranormal Ulster we had a motion sensor on a window next to a spiral stone stairs where reports of a shadow figure had been reported by many members of the public. We also had a Geophone on a step two steps above the location of the window(the sensitivity had been set so that it only activated from either two steps above or below where it was placed) and a locked off CCTV camera on a ledge above the location to capture everything. During the investigation we get a call from base Station to say that the Geophone was flashing. When we arrive at the location the motion sensor light was also on. Thinking we may have set off the motion sensor by our arrival we checked back on the CCTV to discover that the Motion sensor had come on about 15 seconds before we arrived. For a good forty minutes the motion sensor and the Geophone would operate consistently upon request in whatever order we requested them to activate. So while this does not exactly answer the question you asked, it does demonstrate the potential effectiveness of various pieces of equipment being used collectively as part of the investigation process. Are you psychic? Do you consider being psychic a help or a hindrance for paranormal investigations? I have worked on investigations both with and without psychics/sensitive/mediums and from a research point of view it all serves to inform our practice so I would dismiss nothing from the outset and begin a process of elimination from there with regard to review of findings and evidence etc. What makes a great haunted location? The potential that anything could happen at any time. If you could investigate any haunted location, where would that be? There are many tales handed down through folklore stories in Wexford town of tunnels that pass underneath the town from the Friary Church to the harbour area. If it was possible to access these then they would make for one very interesting investigation indeed. What scares you about Ghost Hunting or Paranormal Investigations? In your opinion, what is the most haunted area in the UK or Ireland? Read any good paranormal books or watched any good paranormal TV shows/movies recently? I am a bit of a bookworm and I read everything I can be it books, articles and magazines. I am currently finishing A Natural History of Ghosts by Roger Clarke. I was given an early copy of True Irish Ghost Stories by Seymour and Neligan. It was first published in around 1914 it is interesting to observe how perspectives and ideologies have evolved over the last 100 years with regard to the subject of the Paranormal. Tell us about your favourite moment from a paranormal investigation. On a private case we had stopped to take a break and I was standing behind the DVR and monitor while three other team members were sitting in front of the screen. On this particular investigation there was no electricity in the house so we had a generator running out in the driveway to power our equipment. During this break we were discussing our plans for the next stage of the investigation when the monitor screen went off. I concluded that the petrol must have run out of petrol but when I looked at the plug lead the pilot light was still on. I therefore assumed that the fuse must be gone in the power cable so we got a cable tester and found that the lead was ok. We then tried a different lead and again it would not work. After numerous attempts I decided to leave the monitor power lead out and told the Guys that we could just have to review the footage later. About ten minutes later the DVR monitor switched itself on causing the crew to say they could see the cameras etc. It wasn’t until I held up the end of the unplugged power cable that they realised what had just happened. I am not prepared to say that it is a Paranormal occurrence but it certainly is a significantly unexplainable one in a conventional sense. 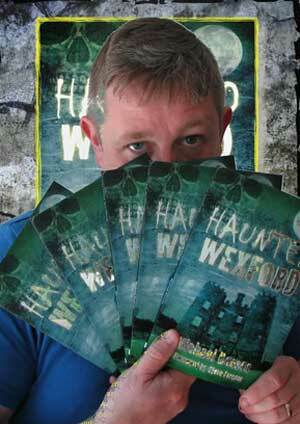 You can follow Friends of Wexford Paranormal here. Guest writer GUY LYON PLAYFAIR investigated The Enfield Poltergeist first-hand in the 1970s. He takes a look back at the spectacular case for The Spooky Isles. Most Haunted – do you love it or hate it? Spooky Isles is looking for your views on Most Haunted - do you want to review an episode? Spooky County Limerick is a place of mysticism, darkness and the devil. ANN MASSEY O'REGAN tells us more.